This page is about mistakes I have made in my games. At first i was very pleased with this game. Not many mistakes occurred in the first half of the game. 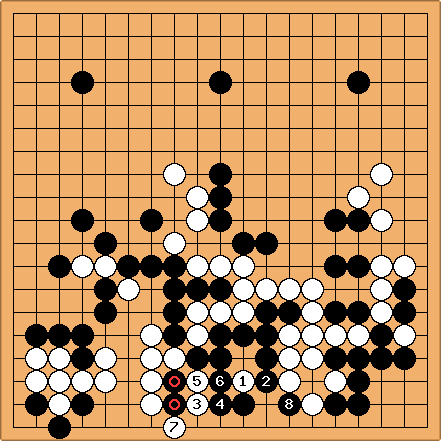 After a good long fight, white was in a pinch for making his big group live. He decided to attack my lower group, if it dies, he would gain a very great advantage, if it lives, white would have a lot of trouble turning the game around. In the next diagram is an illustration of how black could have had a chance to survive the fight. 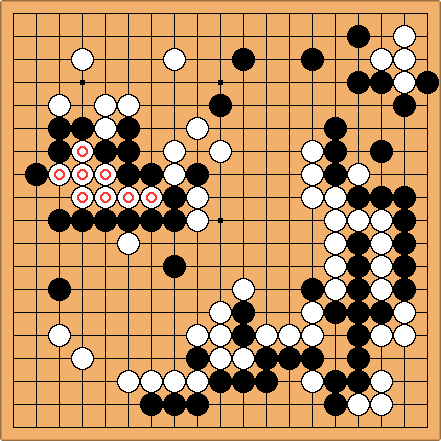 After 'Black 8' a ko is formed. whoever wins this ko, will most likely win the game. The second mistake was when I played 'black 1' instead of 'a'. I didn't want to give white a lot of territory, but instead, my marked group died afterwards, giving white a very very big corner. After losing 2 relatively large clusters, the game was not yet over. But when I made a final reading mistake in the endgame, white was leading by over 50 points... I resigned. 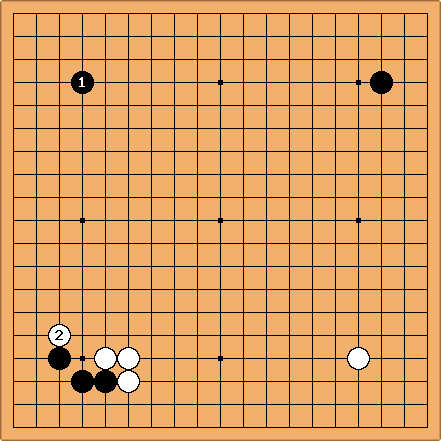 After playing 'black 1' to 'black 7' I removed my own liberties and sealed my own group in, making it dangerous. The bent 4 has now become a normal ko. I won the ko due to a stupid mistake, and right after that, he resigned. I played carelessly thinking I would deffinitly win. I made the wrong decision at the wrong time everytime. I didn't pay enough attention to flaws in my formation, allowing him to break trough almost every time. I didn't read deep enough into most moves. There where a few BIG mistakes that gave him the advantage most of the time. However I managed to crawl back to an even game and even take the lead from time to time, he always found some big flaw, taking a 20 point lead every time. I had crawled back to take the lead about 3 times. This sequence caught me by surprise, I didn't expect black to take the entire left side in 1 move. Being a little shocked, I tried to calm down and still play a pretty decent game. After a while I managed to take his lower right corner AND get a lot of influence towards the center. By playing the move marked with a circle, I thought I could take the center, however I miscalculated the value of this move, because black has many ways to reduce the centre. The stone marked with a square was to protect the cuts.. however, playing at 'b' would have been a better shape. After a desperate attempt at saving the centre, I lost a cluster of stones. I almost resigned before I counted the current scores. There was a 23 point difference, wich was worth playing for. Even if the centre isn't even half of what it appeared to be, all was not lost. I managed to get my "cool" back and played a few big moves marked with a circle. After 'black 1' I managed to capture his stones while saving my own stone that seemed doomed. At this point I am leading the game with about 20 points. 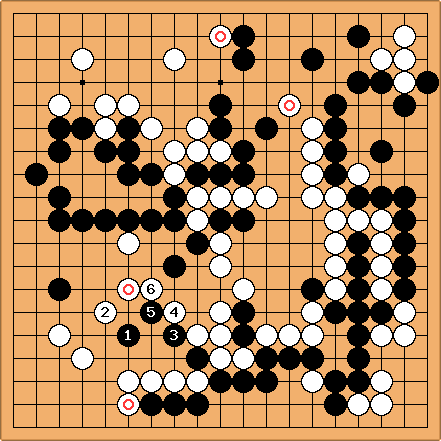 Even after taking back the lead, I desperatly hung onto my stones, while sacrifising that small cluster and playing at 'a' taking the upper side, i tried to save them, resulting in black taking half of the upper side with a ko. Ofcourse he won the ko, taking half of the upper side, however giving away his upper right corner. 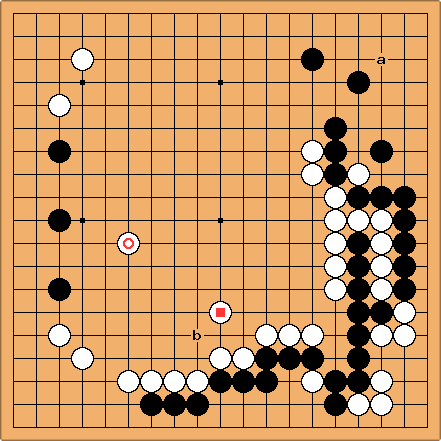 The ko managed to put the marked black stone as a threat making me capture the other marked black stone. After a while, I managed to maintain a 12 point lead, untill black played at 'b'. After that, black got into the secure territory I already had, and won by 11,5 moku. There where 2 big mistakes in this game, the first one happened on the bottom right corner. 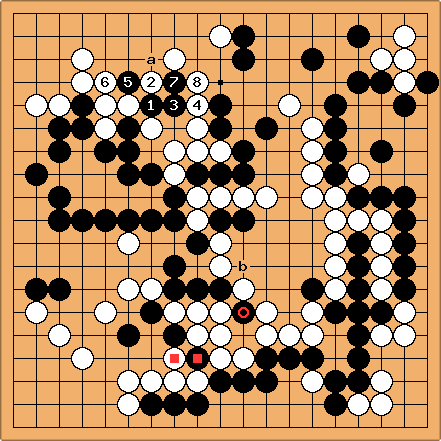 Instead of playing the move at 'white 3' I played the move at 'black 2'. 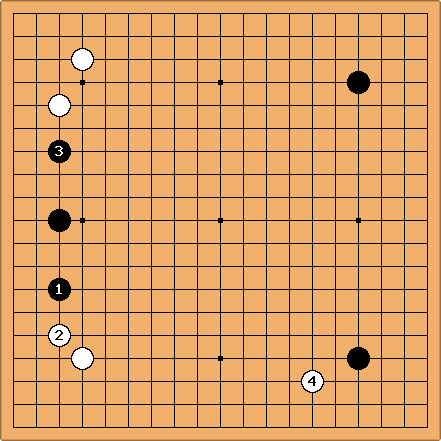 The following sequence resulted and after 'white 9' I played 'a' and white played 'b'. resulting in the death of black in the corner. This gave white the points he needed. 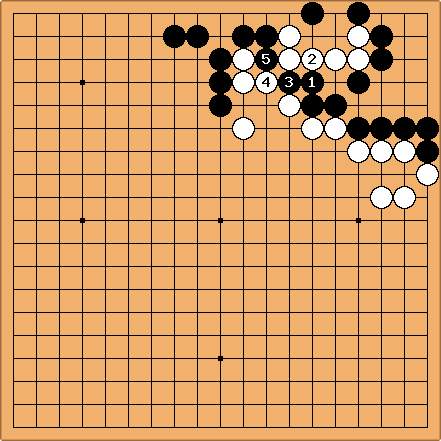 White got a big corner and influence towards the top right, This was a big setback for me. This was the biggest mistake I have made so far. After I ignored 'white 3' white played the move at 'a' killing the entire corner. With the corner being murdered, I resigned. If this didn't happened. After losing the bottom right group as seen in the foregoing diagram. It would have been W+13,5. Wich is not bad since it was a game against a 7d ^^. 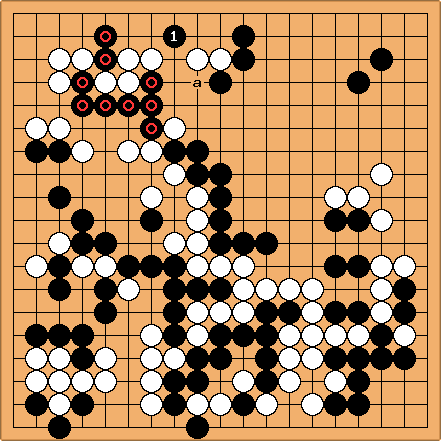 This is only the upper right part of the entire game, this is actually the last few moves of yose. 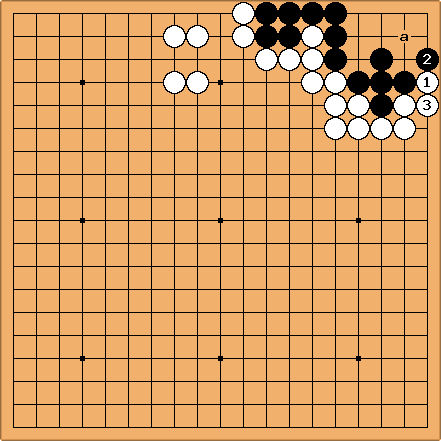 If this mistake wasn't made, I would have won the game by 14,5 moku. Instead I played 2 where I should have played the move of black 3 instead. this way, I wouldn't have gotten cut off and won the game. Instead I lost by 2,5 moku because of this cut. Instead of following joseki, playing the move at 'a', I played 7, leaving a nasty cutting point at 'a'. I wanted to make influence to the bottom left side, because another extention from black would be too big. I gave away the corner in order to be able to reduce the bottom side and later the top right side. Even after 5 the cut was still dangerous, so I was very pleased to see that syuqei played the move at 'a' so i could defend the cut at 'b' while securing the territory i have made. The rest of the game went peacefully, with some attempts from black to greatly reduce my territory, leaving only a trail of dead black stones. I won the game by resignation.